Biking Across Kansas, the annual week-long supported tour across the Sunflower State, has announced their 2018 route, which crosses the southern tier of the state, for a total of about 559 miles, June 9-19, 2018. The tour leaves Johnson City, near the Colorado border, on Saturday, June 9th, and arrives in Fort Scott, near the Missouri state line, on June 16th. 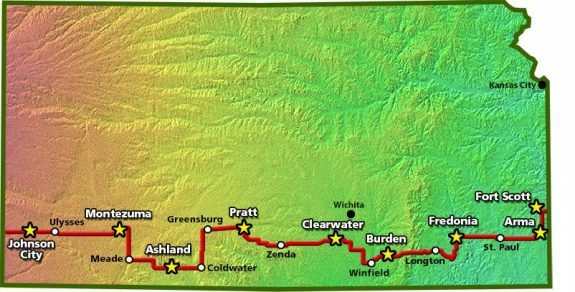 The route covers about 559 miles, with overnights in Montezuma, Ashland, Pratt, Clearwater, Burden, Fredonia, and Arma. Learn more at the Biking Across Kansas web site.